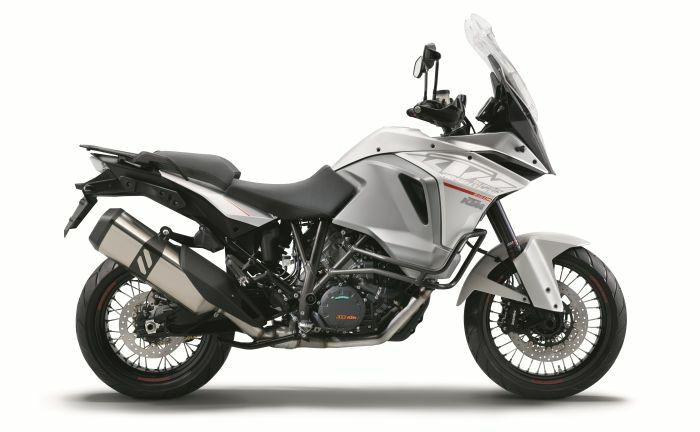 It’s been a long time coming but the BMW R1200GS Adventure (GSA) may finally have a serious competitor in the KTM 1290 Super Adventure. 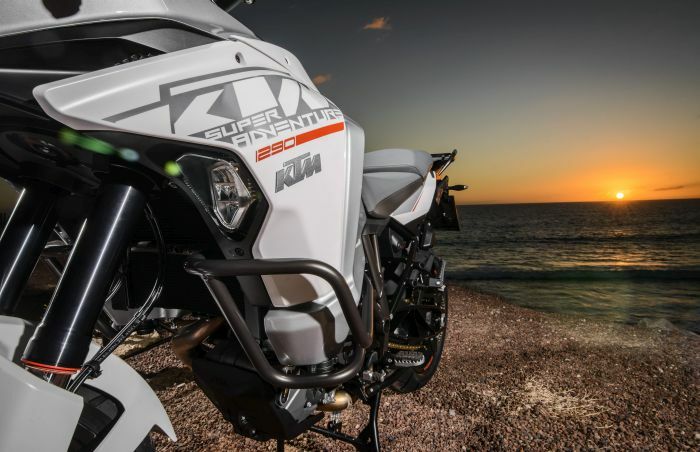 The Austrian manufacturer is commonly known and appreciated for its off-road capable machines but their latest adventure bike has been flaunted with terms such as ‘luxury’ and ‘travel’ being the focal point. In fact, at no time during the press conference did KTM mention off-road ability, instead sticking with the aforementioned terms, and why wouldn’t they? You’d have to be mad to spend £16,000 on this bike and then contemplate a life on the Road of Bones. The KTM is a luxury, enduro-styled tourer and if confirmation were needed of its intended market, the fact that the test ride took place on Gran Canaria, in a tarmac only affair, should be enough. For 99% of the motorcycle buying public these super-tanker sized adventure styled bikes are far too big, heavy and expensive to be taken anywhere near a gnarly trail. But they do possess excellent touring ability and comfort plus a chic adventure presence ideally suited for parking outside five star hotels on the Riviera. The 1290 Super Adventure has a formidable presence. It’s tall and wide in the GSA mold but the overall appearance is more of an angular stealth bomber than a battle ready B52. In keeping with the ‘luxury’ tag and doffing a cap to the colour sensitivities of (I would guess) an older and more affluent buyer, there is a distinct lack of the companies in-your-face orangeness in favour of a classier white, grey and black colour scheme with just a tasteful splash of orange at the margins as a reminder that you’re looking at a KTM. 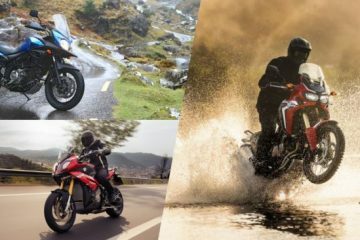 The company have thought long and hard about what the market and buyer of this genre of bikes demands and that’s reflected in the long list of impressive top end features. For starters, the rider and pillion have heated seats and both can be adjusted independently with a conveniently located temperature control knob for the passenger to operate. KTM have also gone big on safety features by including pre-set riding modes, advanced ABS, traction control and semi-active suspension. The combined effect of all these technological advances working in automatic harmony is a motorcycle which the company professes to be one of the safest on the road, and that’s a claim I’ve no intention of challenging. 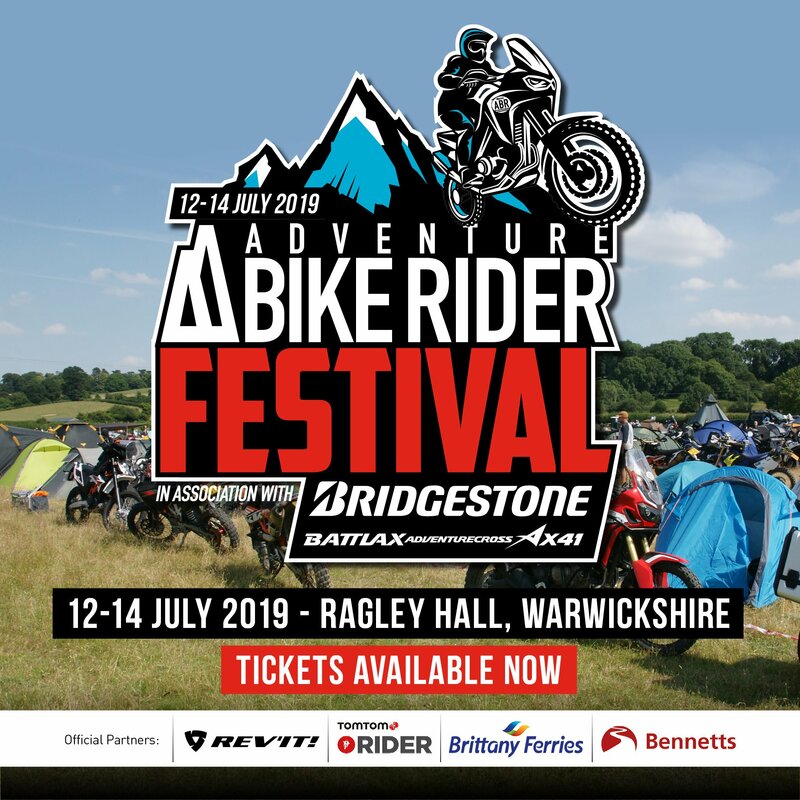 You get heated grips, LED cornering lights, 12v power socket, hill start assist, coin tidy, centre stand, crash bars, 30-litre tank, tire pressure monitors, immobiliser, ride by wire, cruise control, adjustable seat, bars, levers, pegs and screen. If any part of the bike could be customised and controlled through electronic wizardry then it has, with the noticeable exception of the manually adjusted screen. In practical terms, there is just so much high technology built into this machine that it should come with a glossary for ease of understanding. C-ABS; MSR; SCU; MTC; MSC; SAES… I could go on. On the face of it, the complexity of the new KTM could appear overwhelming and not necessary, but in reality most of what’s going on underneath the electronic hood needs minimal input from the rider to get the best out of it. If you’ll allow a little personal indulgence before I move onto the ride, then let me tell you that I simply loved the look of the new 1290 and having thrown a leg over the beast it certainly came with that king-of-the-road presence and kudos that’s been lacking in any GSA competition to date. 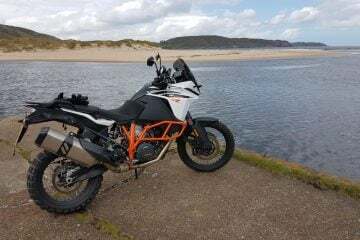 I can also reveal that it was a case of astute planning on the part of KTM to base the test ride on a small Island in the Atlantic, if it had been in continental Europe, I’d have just kept riding until the company gave up the chase and the 1290 was mine. Perhaps now is also the time for some balance in this review because there were a couple of issues with the bike, one I could live with and the other, in my opinion, could well affect sales. First off, the 1290 comes with the same hot seat irritation I experienced on the 1190 Adventure. Put simply the heat from the engine permeates the rider seat to levels that can affect comfort, though I hasten to add that it’s nowhere near as hot as I experienced with the 1190. On cold, wet days or in winter conditions, and taken in tandem with the heated seats, it would be a blessing. However, when stuck in slow moving summer traffic the effect would be noticeable. The second point could be a deal breaker for some buyers at the expensive end of the ‘luxury’ travel market − the lack of a maintenance free shaft drive. I know from personal experience that there are many well-heeled riders of a certain age that have become accustomed to the no fuss nature of a shaft drive and would not consider the move back to a chain driven machine where regular maintenance and adjustment is necessary. If the KTM 1290 Super Adventure has an Achilles heel, this is it. For the ride out I set the seat on the high setting, adjusted the screen to below eye level, programmed the pre-load for rider plus luggage (I like, and my size demands, a touch more pre-load) and dialled in the street performance mode. 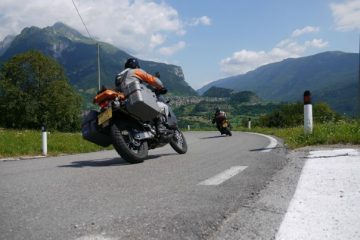 A short ride from the hotel and we were on a motorway where I found myself isolated from the main group having been held up by a couple of slow cars in the fast lane. When the road ahead cleared I got my first chance to experience the arm snapping power of the 1290 and what an exhilarating event that was. From pleasantly tootling along to warp speed in an instant with no noticeable fall off in momentum until the rev limiter cut in. There is no other way to describe the performance of the 1290 other than being blisteringly fast. 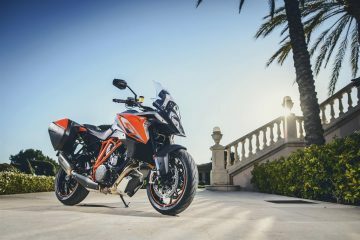 The LC8 V-Twin engine which delivers this stunning performance is the enlarged 1.3-litre version of the 1190, similar to that found on the Super Duke R but with a re-designed cylinder head, heavier crankshaft, revised fuelling, longer sixth gear and re-modelled exhaust to provide a more touring-like performance – think smoother. However, with 160bhp and peak torque of 104ftlb (6750rpm) at your service you can have your touring main course served at speed and performance levels that would not be out of place on a NASA chart. Catching up with the group we settled down to motorway cruising speeds and the quality, comfort and refinement of the KTM was obvious. I kid you not, riding this bike at 70 mph is as comfy and stress free as it gets until you move up to a motorised memory foam divan. The screen is one of the best I’ve ever experienced at keeping the wind and elements at bay, if pushed I’d say more effective than the model on the current GSA. The width of the tank protects the lower body and I genuinely sat there thinking it doesn’t come any more serene than this on an adventure bike. KTM should consider offering an optional tank mounted playing card table for deploying on monotonous long haul motorway jaunts. With the seat set on high the riding ergos and mirrors were spot on for this 6ft 2in rider. With adjustment available at all contact points unless you’re way below or above the average there’s likely to be a setting to suit. Pulling off the motorway we headed into the mountainous interior of the island where in years gone by I’d imagine local Government laws forbid the making of a straight road. What followed was a sequence of single track and dual lane tarmac with sweepers, chicanes, blind 90 degree teeth grinders and alpine zig zags that made the north side of the Stelvio Pass look like a seven lane motorway. KTM claim that the Super Adventure is one of the most technologically advanced motorcycles in the world and also one of the safest. Huge amounts of planning and resources have gone into partnerships with brands such as WP and Bosch to develop electronic systems designed to keep the 1290 and rider rubber side up. The ABS system incorporates lean sensors (C-ABS) which makes braking in corners less likely to result in an off. That’s not to say you can ride like a berserker and heave ho mid-corner without the world turning upside down. It means that should you get it wrong the system is on your side even when banked over on a bend allowing you to brake assuredly and rely on the inbuilt safety net to keep you upright. And it works, I know so. Staying with safety systems, the 1290 also comes with a hydraulic PASC slipper clutch coupled with Motor Slip Regulation which automatically releases the pressure on the clutch discs whenever the torque feedback from the engine is too great. In plain English that means no back wheel bunny hopping from over eager down shifts. Once again, this is a feature that works very well in the hills of Gran Canaria. Add the above two features together, throw in a serving of excellent traction control and you end up with a bike that you can push very hard on alpine style roads with increased confidence, safety and the resulting enjoyment. I’d also add that the front and rear Brenbo brake units perform at a level to complement the weight and power of the 1290. Staying with the brakes, the 1290 possesses a hill start feature where the brakes stay engaged for five seconds when the rider releases the lever on an incline. This is a great help in retaining stability and eliminating roll backs on steep inclines when operating the throttle and clutch especially so when you’ve the extra weight of a pillion and luggage on board. The suspension set up on the 1290 is top draw. Semi active WP systems at the front and rear offer the rider four damping settings from which to choose – comfort, street, sport and off-road. But that’s not half of it. 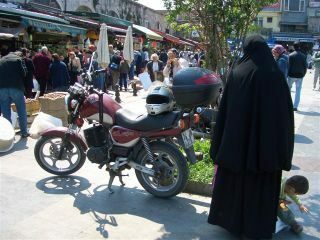 There’s also four pre-load modes; rider; rider plus luggage; rider plus pillion; rider plus pillion plus luggage. And here’s the really clever bit; when you take on the extra weight of a pillion and luggage the semi-active damping system automatically responds to keep settings optimum. There’s more automatic suspension magic; select ‘street’ and then ride like a Moto GP groupie and the suspension alters on the fly. 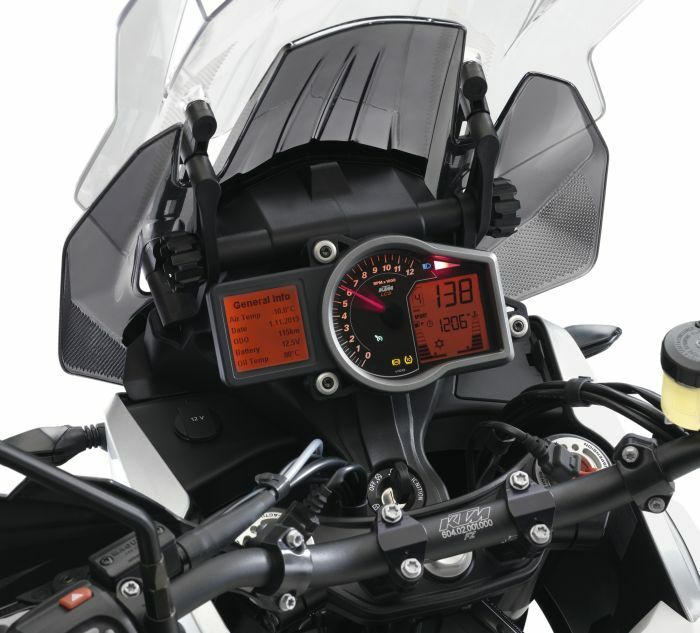 The 1290 has stroke sensors and accelerometers at the front and rear pulsing information to the CPU which alters the suspension mapping to suit the current style of riding. Not once did I feel that the system was anything other than in tune with the ride and conditions and when you throw in the excellent anti-dive function and the inclusion of a discreet steering damper you really do have a suspension set up at that’s as good as it gets. Not to be confused with the similar name suspension settings the 1290 features four riding modes; sport, street, rain and off-road. The settings engage engine performance maps better suited to the self-descriptive style of riding with the performance of the latter two limited to 100bhp. 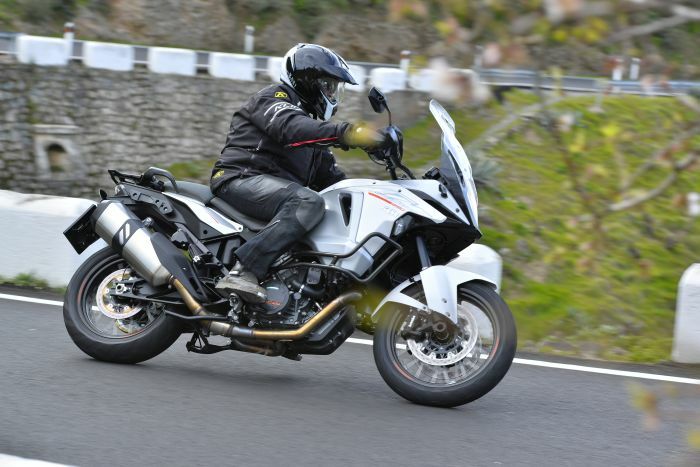 The modes also alter the level of traction control (TC) intervention at both the front and rear, though the rider has the option to override the system and turn the TC off. Riding through the volcanic central hills of Gran Canaria provided ample opportunity to check out the performance and safety features of the 1290 and I returned to the hotel knowing I’d just ridden a bike that had upped my ability and confidence levels perhaps more than any other before. 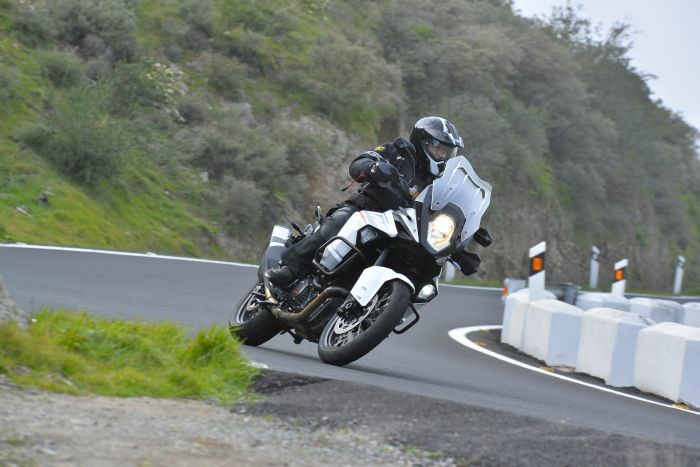 The technology built into the Super Adventure works, it performs so well that by mid-day my trust was complete and the afternoon was spent on twisty mountain roads enjoying a level of high speed thrills that only a superbly put together motorcycle can deliver. 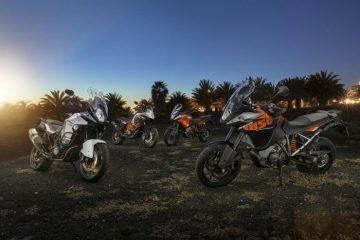 The KTM 1290 Super Adventure has entered a sector of the market where prestige, image and comfort play a significant role in the buying decision as do the staples of performance and features. On the latter two points the 1290 will not disappoint, quite the opposite, the Super Adventure will positively thrill a new owner. The £15,999 price tag will no doubt ensure an element of exclusivity and prestige plus the KTM badge, whilst not (yet) viewed as a ‘luxury’ brand, certainly carries enough European panache and all conquering wilderness kudos to satisfy a significant number of image conscious riders. The 1290 will also have to perform as a fully loaded two-up tourer and whilst I’ve not had the opportunity to test ride in such conditions there’s nothing to make me think it’s going to be anything other than a success. So, if the thought of writing out a cheque for £16,000 doesn’t bother you and you can live with the practicalities of a chain drive it’s time to join the cue, behind me. 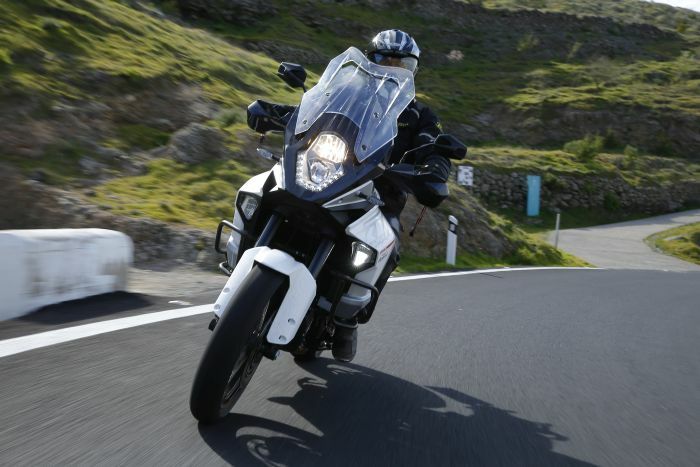 In a line: Ground breaking adventure tourer with arm snapping performance. Safety features and protection from the elements score high on the 1290 and you’ll soon be looking for a job with a longer commute. In reality I don’t think for one moment that commuting ability will be a big draw for Super Adventure buyers. You’ll be wishing a calendar year contained more weekends. 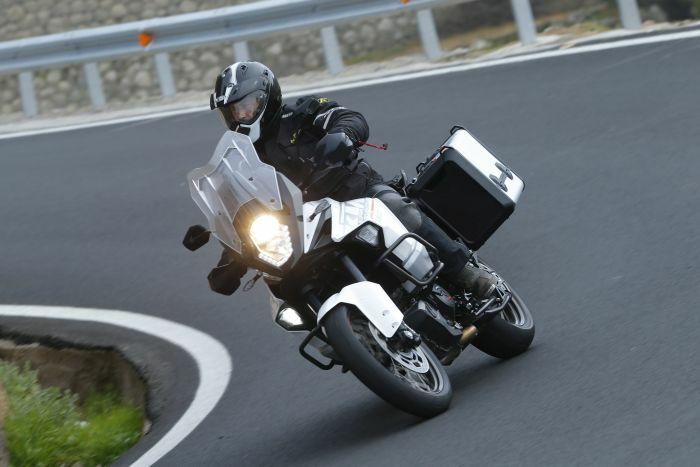 If you can afford the bike you’ll not be that bothered about the moderate mpg, just enjoying the fact that the Super Adventure is a big, powerful, comfortable load carrier that’ll have you looking forward to those weekends away. As ever; any bike can be taken off road and I’m sure we’ll soon be viewing YouTube videos of 1290s kicking through the wilderness with ease. I’ll qualify that by saying the riders will no doubt be in the top 1% when it comes to ability and it’ll not be their bike. If you want off road prowess, then test ride the KTM 1190 R Adventure. If you buy this bike just make sure you have enough cash left over to satisfy the travel cravings that will inevitably follow – your dreams will be filled with setting off into a European sunset moments. As good as it gets. If you’re sticking to the tarmac then why not? If you’re planning on drifting through remote mountain ranges for the next five years then look elsewhere. We’ve yet to check out the pillion carrying capability of the 1290 though suspect it has the ability to be the catalyst for a long and loving relationship. Power, protection and comfort come as standard.